The life of a student is an ocean of periodic monotony interspersed with few islands of absolute repose and even fewer ones of great brilliance. 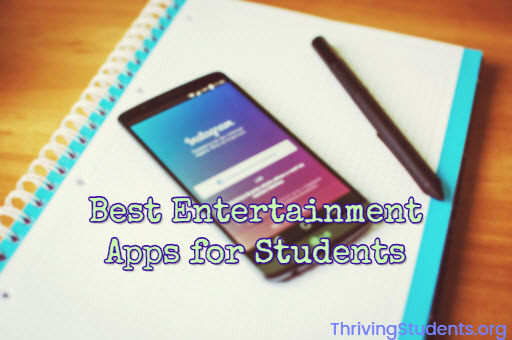 It is that very moment of brilliance that we hope to expand upon with our list of entertainment apps for students. Right off the bat, we recognize that many students are movie buffs and mini-series fans and scrap together whatever time is left over from their academics to these moments of outrageous cinema. You can check out our list of inspirational movies for students and also the essential Android apps for students here on our blog. In the below list, I’ve mentioned some music and movies apps for students who are downloadable Android apps and services. The journey for finding the ideal entertainment is an intimate one and should not invite undue interference. Hotstar allows its users to watch the latest movies, tv series and even live cricket broadcasts! What do you do when the time dedicated to your tv viewing has expired or just denied? You head off to the privacy of your room, switch on Hotstar and enjoy watching the show of course. There are those who would prefer to visualize the action, suspense and drama in the comfort of their minds rather than seeing it blatantly displayed within the boundaries of their televisions. We all know that real fans of The Game of Thrones are the ones who read the novels. Call me a white walker if I am wrong. This is one of the best features offered by Google. Armed with nearly countless books from the play store, the Google Play Books allow the users to read books with various formats such as pdf, epub, Mobi and others. They even have Harry Potter. What else do you need? The Netflix app is one among the top applications for finding the entertainment with watching movies. Netflix is available for Android and iOS of all variants. It can be downloaded with apk to your Android. Isn’t it irritating when you are the only Linkin Park fan in your group? Can you imagine the horror of having a band play in your city or a nearby city without you even knowing it? For those who concur, nod your head wisely and download the Gigbox app. This digital godsend acquires the names of your favorite bands from your playlist and correlates them with their contracted performance schedules via google maps. As if this wasn’t enough, Gigbox has a feature that truly allows you to connect with the heart of the show and feel its pulse rage and subside with every beat. This app lets users chat with everyone present nearby and rate the performance. If this isn’t euphoric, then euphoria is overrated. Music streaming is smooth. Music recommendation? Now that’s a tough cookie. Developed by the music genome project, this app recommends songs based on the genre entered by the user. The real chocolate chip in this cookie is that the recommendation process refines itself based on user’s feedback. Didn’t like a particular song? The app takes it into consideration. Liked a particular song? Expect more songs from the artist in your playlist. Can you hear a catchy tune in the background from one of the nearby rooms but have no clue what it is? Is it playing it in a shop you entered or the radio? Well, now we present you with an unspoken champion, Shazaam. Simply download this app and keep it near the source that emanates the catchy tune. Before you know it, the app will tell you the name of the song and the singer. There is a time in everyone’s life when you can sense a disturbance in the Force. You can feel it in your gut. A meme is slowly taking shape in your capricious head. Something must be done before it fades away. Is it a picture that installed this revelation in you? By all means, then, download Picsay immediately. This app allows a brilliant photo editor essentially. You can do pretty much anything meme related with this app. The cutout feature is remarkable. Just click a picture and replace a fragment of the person’s anatomy or go crazy and replace the whole of it with the anatomy of a cute puppy. The possibilities are endless. One word. Daredevil. One of the best shows on Netflix, and it describes the idea correctly. No, I don’t mean that the app is blind as a bat and beats its users to a pulp. I mean that the idea of streaming video on demand tv series is brilliant. There are those shows that do not get the budget they need for making their very own tv shows from Entertainment titans like Marvel, NBC and much more. Netflix gives these shows a chance to prove themselves. Why don’t we reciprocate and give Netflix a chance too? The grit and brutal reality of today’s media lack the ‘punch’ that they did in the good old days. Remember how cartoon violence and comic relief featured on the brightly colored magazines as the superheroes and vigilantes served justice with their fists? Well, this app allows users to create their comics and use their pictures as framing devices too!! Fans of the Christopher Reeves era owe it to themselves to check out this app.